Du hast by Rammstein from the album “Sehnsucht” 1997: Ah yes, the awesome German Metal band, Rammstein! I absolutely adore this song! I don’t speak any German myself, but that doesn’t mean it’s not an enjoyable song. It starts with and eerie, but cool synthesizer, and then it transforms into an awesome drum and guitar oriented Metal piece with awesome vocals. If you love Metal, then I highly recommend this song to you! Tell me what you think in the comments section below. Happy Listening 😀 AND ROCK ON!!! Konbanwa everyone! It’s Wednesday, and you know what that means! It’s time for me to once again dive into the weird and creepy world of Japanese mythology. I hope you guys are ready for this week’s entries. Now, let’s get started! Don’t mess with this monkey! The Hihi is a very strange, but disturbing creature of Japanese folklore. It’s a rather large monkey-like creature that lives high up in the mountains. 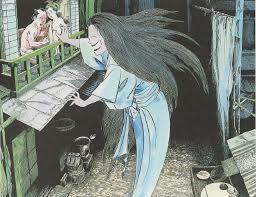 (yokai.com) It’s covered with long, black hair, a wide mouth, and long flapping lips. (yokai.com) They’re named after the loud noise they make when they laugh. 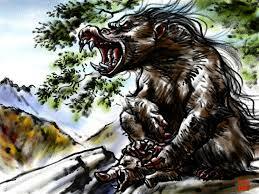 (yokai.com) They mainly prey on wild animals, however, they are also known to eat humans, if given the chance. (yokai.com) This is going to get kind of graphic, you have been warned! The only way to stop a Hihi is to make it laugh, while it’s laughing, you drive a sharp spike into the middle of its forehead! (yokai.com) Gross right? Beck’s Bolero by Jeff Beck from the album “Truth (Remastered) Originally Released 1968: Ah yes, this old, yet epic song. This is guitar virtuoso, Jeff Beck’s version of the the amazing classical piece, Bolero. Almost the entire song is filled to the brim with epic guitar riffs. Also, unlike Ravel’s Bolero that’s about 14 minutes long, Beck’s Bolero is only 2 minutes and 52 seconds long. I love both of these pieces quite dearly, as a matter of fact, Ravel’s Bolero was the first track I ever put on my jukebox! My favorite part of Beck’s Bolero is near the 1 minute and 30 second mark when Beck starts hammering on his guitar! I highly recommend this song to everyone. Tell me what you think in the comments section below. Happy Listening:D AND ROCK ON!!!!! Hello everyone! It’s Tuesday, and you know what that means! 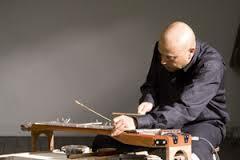 It’s time to once again dive into the strange world of weird instruments. I hope you guys are ready for this week’s crazy post! Well, it’s Monday, and you know what that means! It’s time for me to once again share my love of Art with you wonderful people! This is probably one of my favorite posts to do all week, and hope you guys enjoy it as much as I enjoyed writing it! Now, let’s get started! Into the Waves by Larry Carlson Digital Art 2015: Are you guys ready for this epic and beautiful piece of Digital Art? This has to be one of my favorite Larry Carlson paintings from this year! It’s filled to the brim with vibrant colors, shadowy figures, and cascading waves. 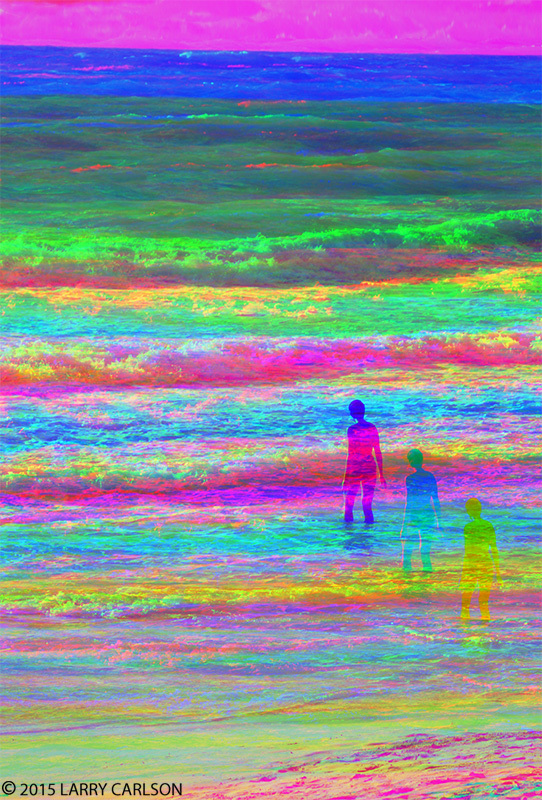 The painting seems to depict a beautifully trippy beach with multicolored waves and misty people. It truely is an amazing sight to behold, and I would love to read about what you think about it in the comments section below. 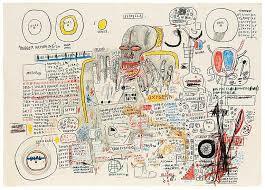 Untitled By Jean-Michel Basquiat Graphite and colored pencil on paper 1985: Ah yes, another beautiful dynamic art piece from the incredible Basquiat! I have always loved and respected Abstract Art, and this piece is a pure definition of it! It’s a lively scene with multiple actions occurring at once. In my opinion, the most prominent figure in the piece is the skeletal man with his hands up. It’s also covered in various words and “Dials”. I think the main reason why Basquiat left this work untitled was because he wanted the viewer to think of a name for it. It’s an unique and epic Abstract art piece! Sweetness by Jimmy Eat World from the album “Jimmy Eat World” 2001: Get ready for a blast to the past! I have always loved Rock music, and when I heard this gem for the first time, I was throughly impressed by it. It’s a very old Rock song that still maintains its awesomeness even to this day! It starts with the interesting vocals of Jim Adkins, and then the guitars and drums start playing, and the epicness starts! In the end, what you get is a very cool Rock track that you’ll be putting on repeat for a very long time! Tell me what you think in the comments section below. Happy Listening:D AND ROCK ON!!! Shining Collection by Iceman from the album “Gate II” 1999 (info about album from en.wikipedia.org): You guys like Japanese Hard Rock? Then this is definitely a song for you! It starts with an awesome guitar riff, and then the drums and other percussion instruments come in, transforming this song into an epic Rock piece. My favorite part of the song is in the middle when you hear an epic piano chord. I’d love to hear what you guys think about this song in the comments section below.